Since the day after hurricane Matthew, we have been scrambling to respond to many pleas for help, mostly from friends. One of those pleas has been a pretty continuous call from Fr David Fontaine, a brother priest who was begging for help for three cut off and isolated areas: D'Asile, Grand Boucan and Baraderes. While traveling to Abricot (Jeremy) and Dame Marie in the days right after Matthew to reach our staffs there, (even cutting our way through the fallen trees to get there), I was on the email constantly trying to get a helicopter to reach Fr David and his flock in these three places. 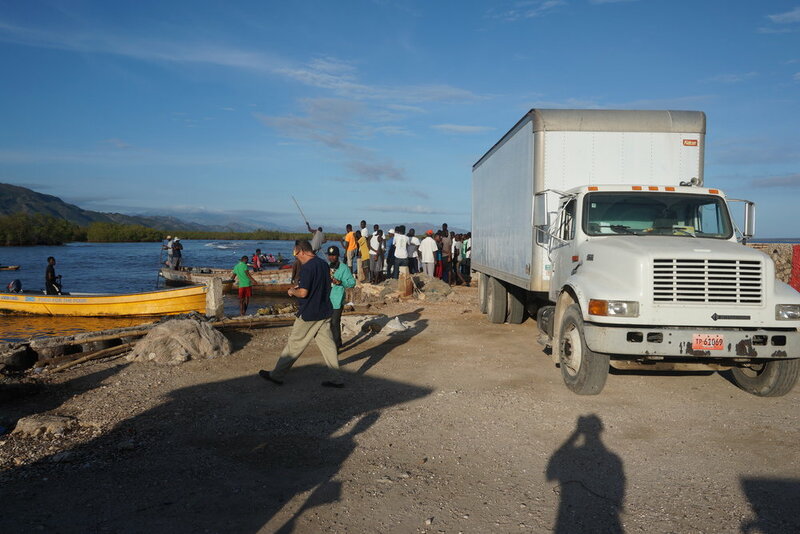 Three days ago, after one aborted try to get to D'Asile by land, we were finally able to get there with food and water- after two blown truck tires and getting stuck in the mud in two different river crossings. Yesterday I decided that since I still cannot get a helicopter, we would try to reach Grand Boucan and Baraderes by boat. We have already lost one of our caravans to brigands, who robbed us at gunpoint at Carrefour Charles at Corail, as we headed to Pestel. When Charles Dickens started his "Tale of Two Cities" with the warning: "It was the best of times, it was the worst of times," he sure knew what he was talking about. In the extremes of times, both the best and the worse are very much present. You can see around you saints and angels, demons and hell, and also the usual herd of apathetics. I think the logic of God's opinion on this, is that because people who make choices for evil still have passion, (which apathetic people lack), and passion at least has the possibility of becoming passionate for Good. When push comes to shove, God prefers bad people to apathetic ones. They can still be redeemed. So yesterday we loaded up 500 sacks of rice and 500 sacks of water (with 60 small bags/sack) and headed toward Petit Trou de Nippes, where we would sleep at the parish house and head off in boats this morning. At 10pm last night, we were nearly at the parish house when, in front of a very small village, two tires of the heavy truck exploded. The village people were first scared, and then smiled, thinking what luck that this truck destined for somewhere else was now their bounty. They first came and stood around in large numbers. This truck was contracted just for this trip, and the driver did not have a lug wrench or a jack. We had to send some of our team on motorcycle to find some "tire men" who might have the right size gear. In the middle of nowhere, this took about 2 hours. During that time, some armed young people came to make their claim. We were completely in their hands. A little girl names Guerlande, who has been at our children's hospital for heart disease, recognized Fr Enzo and called out to him. The armed men saw the sick girl embrace the priest. At the same time, Raphael recognized one of the bandits as being from his old neighborhood. Raphael took out a little rum, shared it, and then stories of childhood flowed. Finally reaching the parish house, itself a victim of Matthew, Fr Luckson gave us small mattresses, so we could lay down and try to sleep (and get chewed up by mosquitos). Before I got my mat, i was invited with Lukson into the church. He wanted to show me something. He explained the church was built in the 1600's, pretty much by accident. Ships passing this area to build the Cathedral in Jeremy became grounded there, and so they decided to build a midpoint warehouse on the spot. The place later became a little town, graced by a Church. The Church of the Nativity. And there over the altar, an original painting of Leonardo Da Vinci, of the babe in swaddling clothes with his mother and father. A beautiful baby, born in darkness and starkness. We set out early in the morning for the boats we rented by phone contact. We had no idea of their size, age, or seaworthiness. We soon saw the leaks could be easily bailed by bucket, and that two trips using three boats a trip would do it for all tnat rice and water. We started loading the boats. The first began to tilt and rock. It looked like it would tip over. All the people watching cheered. This was a second group to think that the voyage was not possible, and so the bounty theirs. 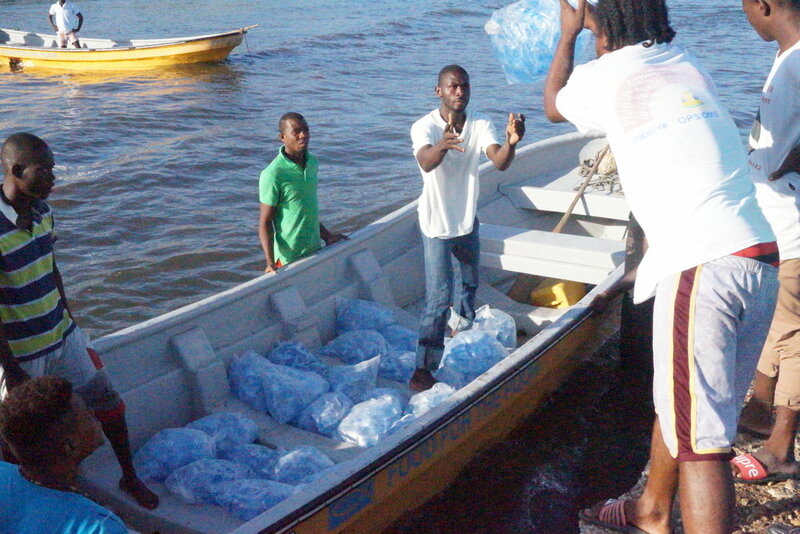 After a while we went, sputtering across the bay to Grand Boucan, to deliver the food to isolated victims of Matthew. In fact we could not make the second trip to Baraderes. The priest there said he could not control the thieves at his wharf. When I hear this I thought, if only he had grown up with one of the thieves. If only he had held another in his arms when she was sick. If only he would open a small bottle of rum to share. The truth is, the world is much saved by what we have done, as it is by what we do. The best way to go through life is building bridges, forging bonds, and cuddling children in our arms. I am back to looking for a helicopter for Baraderes. The best of times, the worst of times. 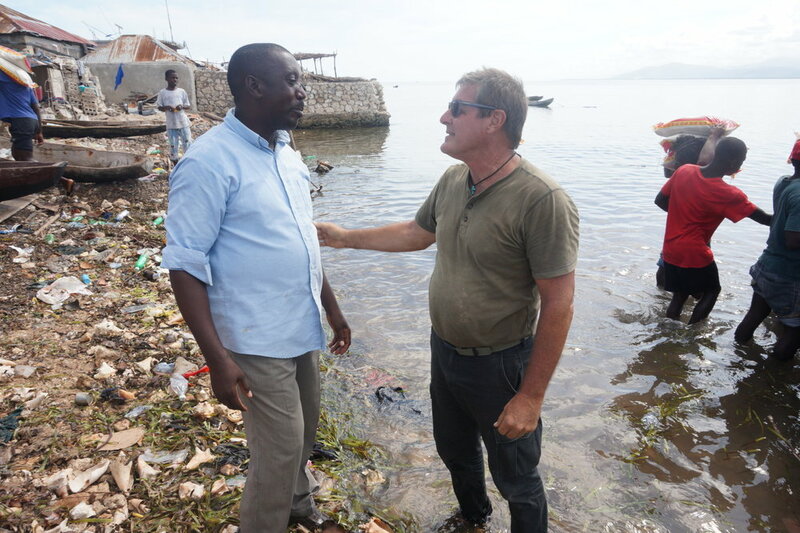 A hurricane and a DaVinci original meet up in a tiny Haitian town. The cynics around us will scoff. The apathetics in our company will yawn. And those open to new life, like a baby born in a darkness and starkness of a hurricane ravaged country, will look eagerly forward to the work of building a future in hope.